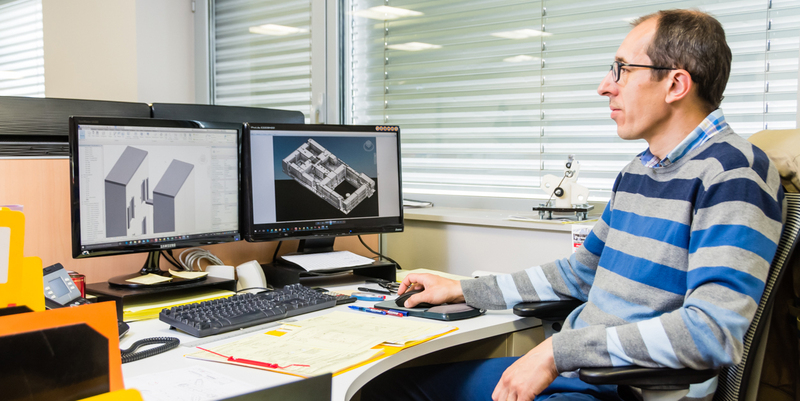 SODIMAS excels in the new world of "digital modelling"
In early 2017, the Sodimas design office was equipped with BIM technology, the latest development in building data modelling systems. Every day, architects and contractors are looking for companies capable of mastering this new tool that is already installed in the daily life of all building trades. BIM (Business Information Modelling) is a digital model that allows the modelling of building data. It is now the indispensable tool for all construction stakeholders: architects, urban planners, drawings offices, project managers, building contractors, economists, council offices, landlords, etc. Integrating, producing, managing and visualising data related to the construction industry becomes possible via one and only tool. It allows for the centralisation and access of all data at the same time to all the key stakeholders in a collaborative and independent manner. The design of a building is complex and requires a good visualisation of the interactions between mechanical structures and the different services (hydraulic, electrical, gas and telephone / TV / fibre). It is also essential that information for the use or ongoing maintenance of the structure is accessible throughout the life cycle of the building. Furthermore, BIM is the tool that meets these requirements by facilitating data access to all stakeholders in the same accommodation construction project. Always attentive to the needs of its customers and those of the market, SODIMAS has invested in its design office at both a human and I.T level. BIM has different levels of detail and information in order to describe a building. The generic term used for this is the LOD (Level of Development). These are in a .rvt or .ifc format, SODIMAS offers a digital model of the lift at a LOD 100 or LOD 200 level. Sufficient to ensure its implementation in a building, these two levels allow the positioning of full-front landings with their equipment and their dimensions. It is also possible to know the position of the power supplies and links between any battery devices if existing. Quick to implement and easily exportable via a smaller file, the LOD 100 or LOD 200 remains the most efficient and economical solution. SODIMAS integrates into the digital model the installation plans in PDF or DWG format and the plans of the lift car in PDF. The choice of parameters and the numbering of the model can be standard or adapted to the customer's BIM chart. All useful and contractual lift information will be directly accessible from the model through links.